The story of beer in Iceland is an interesting one. Prohibition in Iceland began in 1915, and while the ban on wine and other alcohols were lifted in stages, beer over 2.25% ABV remained illegal until 1989. Which, from the outside, seems to make absolutely no sense. Turns out, it was left off the referendum to legalize other alcoholic products in 1936 due to pressure from Iceland's "temperance lobby" (a fancy name for "fun police"), which argued that "beer would lead to more depravity, because it was cheaper than spirits." Depravity notwithstanding, the craft scene in Iceland is now blossoming in a beautiful way. One could even argue that their relative newness serves as a benefit, because unlike many other countries, they're not stifled or limited by pre-existing traditions or "rules" in brewing. Thus, Iceland's fresh eyes can take advantage of ingredients, techniques, and innovations the world over - a little of this from the U.S., a little of that from Europe - in the process of developing a national identity around beer, and assigning a meaning to the notion of "Icelandic craft beer". Seeing as so many brewers are new and small, and thus only distributing minimally within Iceland, the Annual Icelandic Beer Festival is the perfect place to get a taste of the nation's developing craft industry, and see firsthand how Icelandic ingredients and identity are intermingling with foreign influence. Braving the wind and arriving in Reykjavik for the first day of the festival, I had no idea what to expect. I knew KEX Hostel as a great place to stay in the city, and as it turns out, it's also a great place to host a beer festival with a diverse representation of brewers from local to global - brand new Icelandic startups like Lady Brewery (Iceland's first female-owned brewery) and mono. brewing project alongside Brooklyn's Other Half and Denmark's To Øl. Tickets were $140 for three consecutive days of 3-hour sessions, and while not cheap (as nothing in Iceland is) the experience was well worth it. An impressive slate of some of the world's best and most up-and-coming, innovative breweries and collaborations provided an unparalleled selection of interesting brews all three nights of the festival. And where else but in Iceland would you get to try beer with ingredients like Skyr, seaweed, licorice ("lakris"), and "hrútaberin"? In addition to the beers, many of which would not be available anywhere else, ever again, of course the brewers themselves were eminently approachable, friendly, and enthusiastic to have a conversation with the many, many drinkers lining up for their wares. I learned what a "kvass" is from Fonta Flora brewing, and got to try beer accompanied by fried seaweed at Lady Brewery. I had a frighteningly smooth 13%'er from Mikkeller, and commiserated about the trials of shared hostel bathrooms with Anthony from Other Half. The spooky ghost lambic from Bokkereyder was the spookiest I've ever tasted, and the milkshake IPA made its first ever appearance on my palate. I say this frequently, but I'll say it again - my favorite thing about beer isn't just the liquid itself, it's the community that gathers around it, the creativity it represents, and the role it plays in larger conversations about culture, society, and geography. Beer is like a distilled moment of time and place, a tasty expression of history as it develops. There's always something new to try and ways to be surprised when it comes to craft. All told - a very successful festival, and a very successful trip overall, despite some predictably unpredictable Icelandic weather. 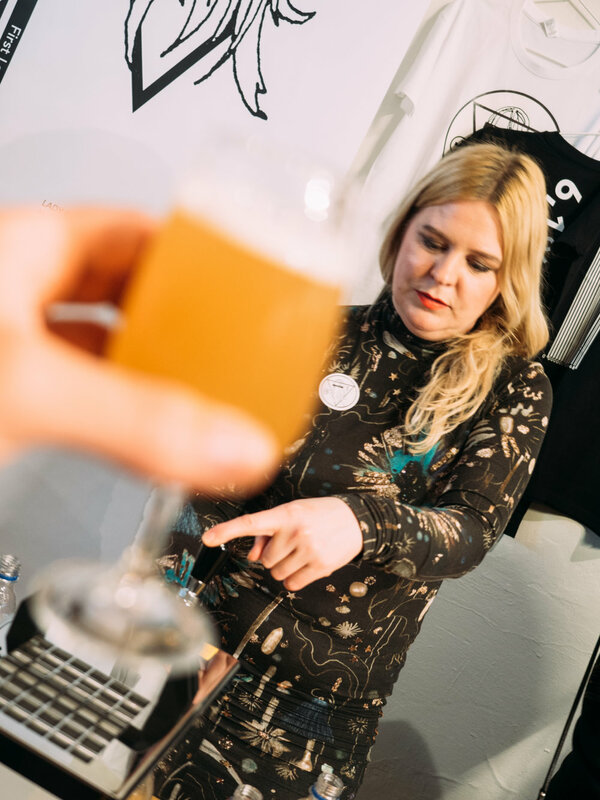 Now, who's ready to gear up for The Annual Icelandic Beer Festival 2019? 18th Street Brewery, Aslin Beer Co., Austri, Barr, Beavertown Brewery, Black Project Spontaneous & Wild Ales, Bokkereyder, Borg Brugghús, Brewing Költur, Brewski Beer, Brothers Brewery, BRUS, Civil Society Brewing Co, Cloudwater Brew Co., Collective Arts Brewing, Cycle Brewing, Einstök, Fonta Flora Brewery, de Garde Brewing, Garage Beer Co., Half Acre Beer Company, J. Wakefield Brewing, Járn og Gler / Malbygg, Jón Ríki, KEX Brewing, Lady Brewery, Lamplighter Brewing Co., Lord Hobo Brewing Company, Mikkeller, O/O Brewing, Other Half Brewing Co., People Like Us, Prairie Artisan Ales, Reykjavík Brewing Company, Segull 67, Smiðjan, Speciation Artisan Ales, Surly Brewing Company, To Øl, Transient Artisan Ales, Vífilfell, Voodoo Brewing Co., Warpigs, Ægisgarður, Öldur, Ölvisholt, Ölgerðin Egill Skallagrímsson, Ölverk and ÖR Brewing Project.